Partnering with our development friends at Code Elves, NorthIQ set out to build a subscription service for comic shops that will help them manage their weekly “Comic book pulls”, and allow their customers to manage their own subscription orders. What we’ve created has proven to be a massive success with customers, and resulted in a near doubling of revenue for the pilot store – All New Comics. There are more than 3,000 dedicated comic book stores in North America, with many of those stores having been around for 20 years or more. In the last decade, the comic book industry has been assaulted by a bevvy of entertainment choices, and comics, while still a $1billion a year industry, are finding it harder to keep their market share than ever before. Technology has the ability to put comic shops on a level footing with competitors like Amazon, and the customer base they have cultivated remains fiercely loyal, but consumers are increasingly looking for more transparency into what they are getting and they continue to look for ways to stay up to date. With over 6,000 monthly products being delivered to comic shops every month, technology can play a key role in improving their ability to serve their customers, and their profitability. Each store gets its own front end, and a unique URL. The store front end can be customized with a unique logo, and the store colours, to provide branding, but all stores leverage the same template, and a shared image pool. This allows each store to stand out, but ensures that all stores are completely mobile responsive, and adhere to website best practices. The management console is the heart and brains of a store, giving the owner full insight into changes to customer lists, current order totals, current subscription revenue, and full reporting tools which can report on revenue, taxes, and much more. In its first year in business, Manage Comics did zero marketing, growing exclusively through word of mouth, however in May of 2017, we began posting frequent blog posts to a dedicated Manage Comics blog. In the beginning, we posted information adjacent to Manage Comics, but we quickly started posting informational posts like “How to Promote an Event for Your Comic Book Store on Facebook”, and “How to use Instagram for your Comic Book Store”. The Manage Comics blog became about more than promoting Manage Comics, and instead became about helping retailers to succeed. The site saw steady growth, and has seen an increase in the number of requests to demonstrate Manage Comics, all with no advertising spend. 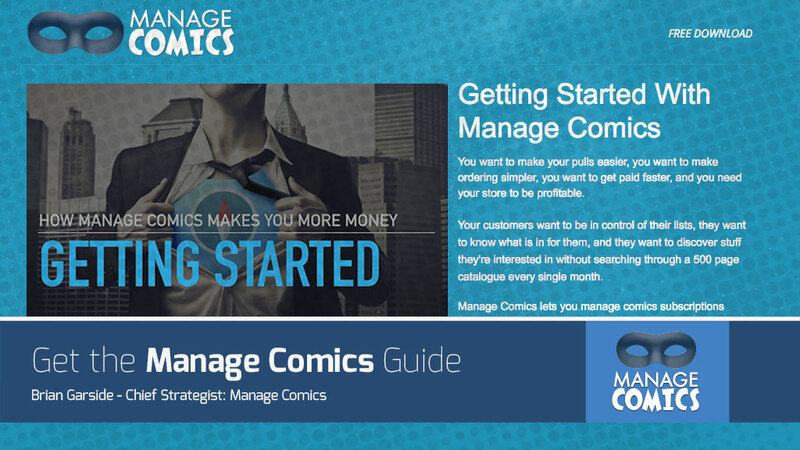 The Manage Comics guide is a 32 page getting started guide that tells prospects how the site works. It uses an Unbounce landing page to add users to a Mailchimp mailing list, where they are automatically sent a copy of the guide.